Ryorin's Ramblings: Fiction Friday: Two and a Half Weeks Until Midnight Blue-Light Special! Fiction Friday: Two and a Half Weeks Until Midnight Blue-Light Special! 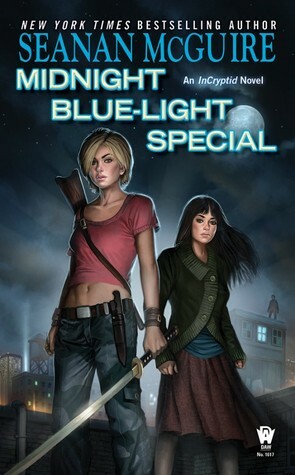 I'm currently packing for an international flight, so today, let's talk about the upcoming release I'm most looking forward to: Midnight Blue-Light Special, book 2 of the Incryptid series by Seanan McGuire, to be released on March 5. Seanan McGuire is quite clearly one of my favorite authors at this point (I'll probably discuss that in greater detail some other time) and last March I brought the first Incryptid book, Discount Armageddon, with me to a conference to read between (or in boring) panels. It was fantastic. I love McGuire's fun characters and detailed world building and that first Incryptid book went above and beyond my expectations, also revealing McGuire's willingness to research all sorts of weird biology things for her books. If book 2 is anything like the first book, I will enjoy it immensely. I'm looking forward to picking this book up as soon as the closest bookstore gets it in. New Schedule! Let's Try For Consistancy!